Natural basins formed by water and erosion over time, watersheds are natural containers that allow us to better understand our environment.More information about Watersheds. 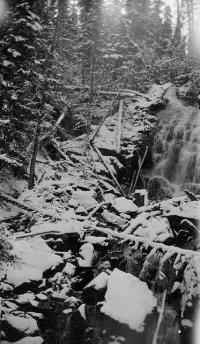 Tributaries & Watershed Address - Boulder Creek and its main tributaries are each unique in their own ways. Some, such as Four Mile Canyon Creek, run much of the year in the mountains but are dry ten months of the year through urban areas. All hold the potential and the promise of flash flooding, for the Boulder area is the number one flash flood hazard zone in the state of Colorado. What is a watershed address? Where is the Boulder Creek Watershed? Image of St. Vrain Watershed courtesy of EPA Surf Your Watershed. Boulder Creek Watershed makes up the lower half of St. Vrain Watershed. See EPA Enviromapper for more information. South of the Boulder Creek watershed, Big Dry Creek flows from Rocky Flats through Westminster and Northglen, joining the South Platte near Fort Lupton. The Big Dry Creek Association's website provides more information about this watershed. Left Hand Creek forms the next watershed north of Boulder Creek and flows into Saint Vrain Creek south-east of Longmont. Left Hand Creek provides the major source for the Left Hand Water district which provides drinking water to about 14,000 Boulder County residents. The Lefthand Watershed Oversight Group has formed to assess, protect, and restore the quality of the Lefthand Creek watershed, and to serve as a hub of communication about watershed issues through the fostering of stakeholder collaboration. James Creek is a major tributory of Left Hand Creek which flows through the Boulder County community of Jamestown and provides its sole drinking water source. CU researchers are studying the effects of erosion and off road recreation on the James Creek water quality. The James Creek Watershed Inititaive is a citizens groups dedicated to engaging the community in protecting the quality of our drinking water and the surrounding forest ecosystem. The Big Thompson River, site of a major flash flood in 1972, flows from Rocky Mountain National Park through the Big Thompson Canyon and the town of Loveland. 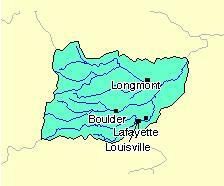 The Big Thompson Watershed Forum offers background information on this important waterway. Article in Westword Magazine on the St. Vrain Creek that has its headwaters in the Rocky Mountain National Park and the Indian Peaks Wilderness and flows through the towns of Lyons and Longmont. "We all live downstream" is a phrase currently popular in environmental circles. And there is truth to this saying, even for the Boulder area which is located at the headwaters of the Mississippi River Basin. The city of Boulder receives some of its drinking water from Barker Reservoir, which receives waste water discharge from the town of Nederland. Even the pristine mountain lakes are being impacted by air pollution from power plants and exhaust from cars. By coming to know our local watershed we can become more aware and responsible for protecting water quality, conserving water resources and being prepared for the inevitable flash floods that will occur on Boulder Creek and its tributaries. The Boulder Creek Watershed is a natural "container" encompassing some 440 square miles and extending from the Continental Divide to the high plains. The St. Vrain watershed is slightly larger, and the two combined watershed drain nearly 1000 square miles of the Colorado Front Range. While the natural system has been significantly impacted by human activity since 1859, the essential natural processes-- particularly seasonal changes and basic environmental systems such as the hydrologic cycle-- continue, influencing our everyday lives in countless ways. BASIN is cataloging available time-relevant data collected under various government and acedemic environmental research and monitoring programs. To facilate access to this information BASIN has constructed a spatial data catalog which maps the available online data resources provided by the BASIN project or available elsewhere on the internet. Many of these reources are discussed in greater detail below. If you know of other environmental data resources that are available on line or would like to help bring new resources online please contact the basin team. What is a Total Maximum Daily Load (TMDL) ? Snowpack information from the SNOTEL monitoring network. What is a cubic foot per second of water? What does 100 year or 500 year flood mean? BASIN What is a hydrograph? Access to local, metro, state, national, international and extraterrestrial weather forecasts. Maintained by the National Weather Service, the NWIN offers a range of current weather news including up to the minute satellite and radar images, warnings and watches, and local weather forecasts. The Weather Channel, the only 24-hour television network, is the premier source for weather reporting and preparedness information. The National Safety Council is a nonprofit organization devoted to promoting safety awareness. Find here a variety of public service announcements regarding disaster recovery including flood safty . Special thanks to Paul Tiger and Janne Cookman for helping develop these links.